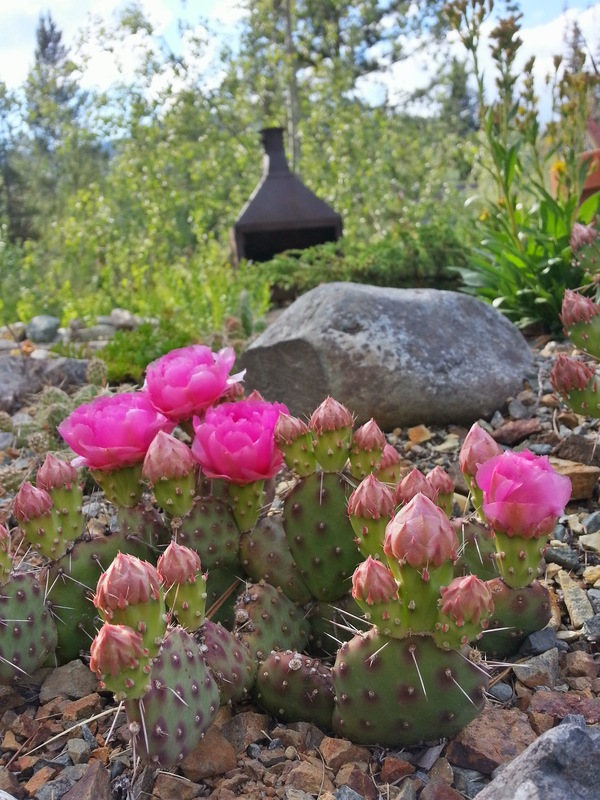 This was not a banner year for Opuntia, or Prickly Pear cacti, in the mountain garden. A lot of plants really seemed to peak in 2013 and 2014 - the following Spring seasons saw me pruning large portions of mature plants to remove rot and disease. 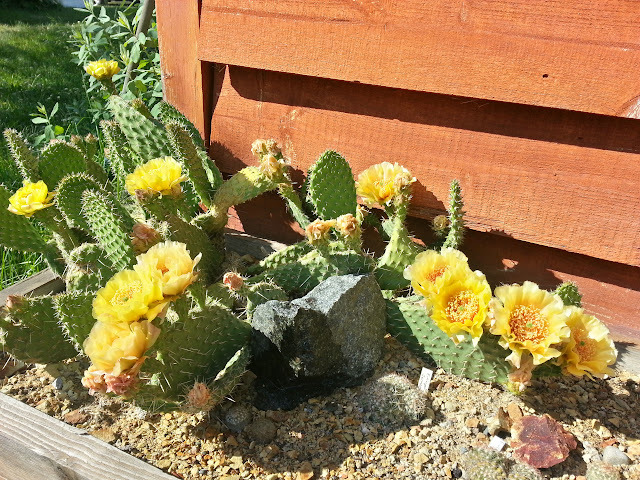 This cycle has been my experience growing many hardy Opuntia in this garden since 2004. Since these plants produce flowers on "old wood" - mostly last year's pads - the Summer following heavy pruning is light on flowers. 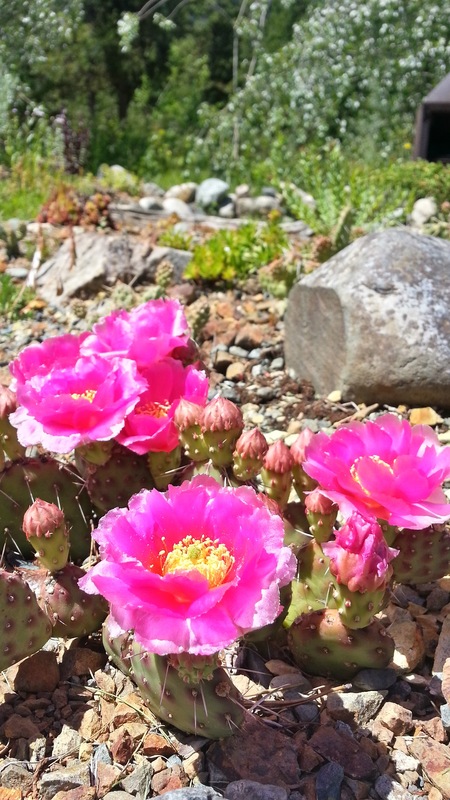 I hope that my new South-facing gravel bed, which was basically a natural feature in the yard "helped along" by the construction of a ramp down to the floodplain along Hayes Creek, will bring about more stability in my Opuntia populations and offer new possibilities with its natural attributes. This steep slope accumulates much less snow during the winter. It is snow-free weeks ahead of my other garden beds, and its Southern aspect ensures it dries out very rapidly and remains well-drained once the snow is gone. It should help me grow more cacti, more successfully. It could really rejuvinate my interest and enthusiasm for these plants. In fact, it already has - I have high hopes for the many cuttings and seedlings I planted in that bed this past Summer. Anyhow, here is my review of the best Opuntiads of 2015. 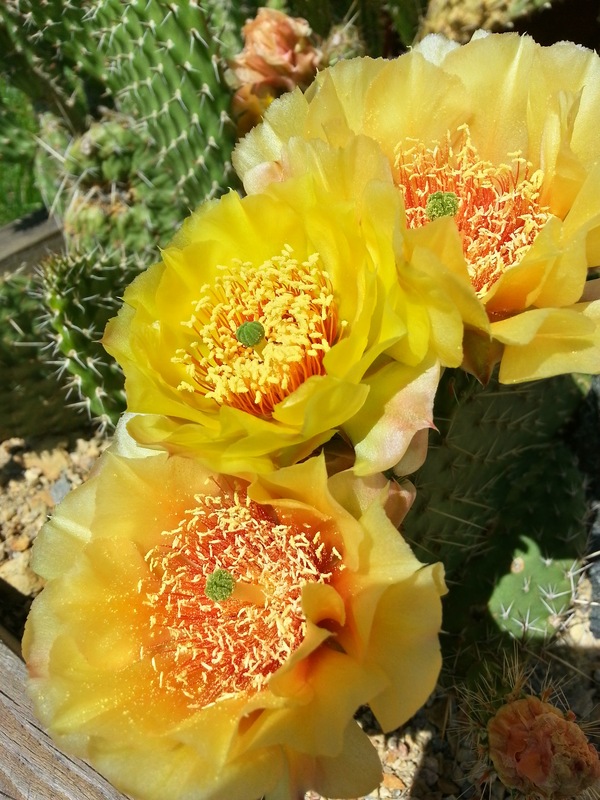 Opuntia "Sandy Hook" is a hybrid by Jean Wieprecht of Edmonton, Alberta. 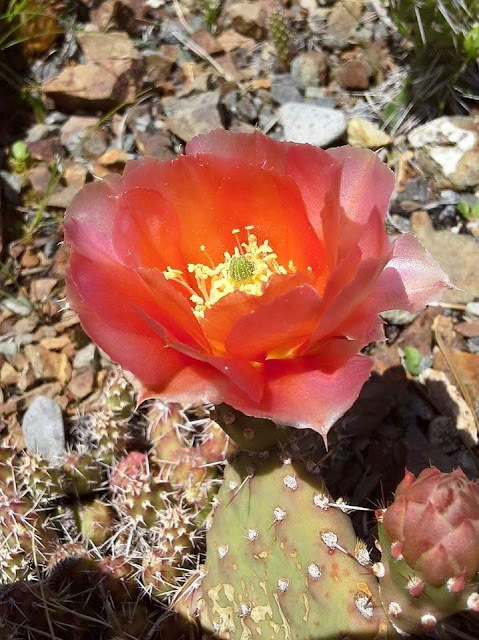 Jean described as being of Opuntia fragilis lineage but in those days (80's, 90's) anything small and cute, including what is now called Opuntia debreczyi, was lumped into O. fragilis. There is no way of knowing for sure, but I'd say this is likely to be of O. debreczyi lineage. 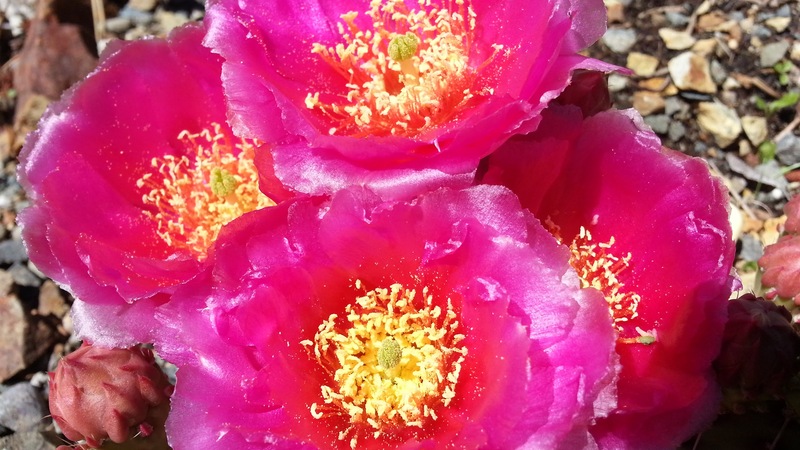 Close-up of Opuntia "Sandy Hook". 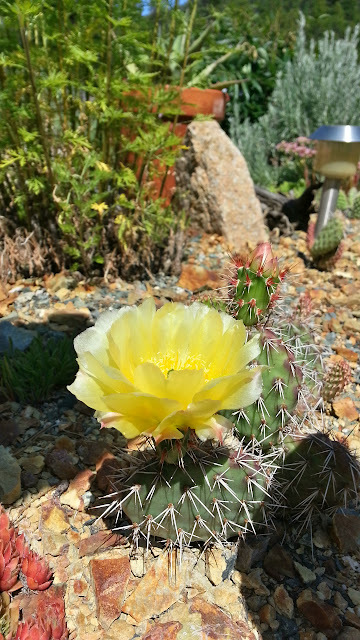 Blooming on June 20, 2015, this flowered appoximately 2 weeks earlier than usual - the earliest I have ever seen Opuntia bloom in this garden! One more of Opuntia "Sandy Hook". 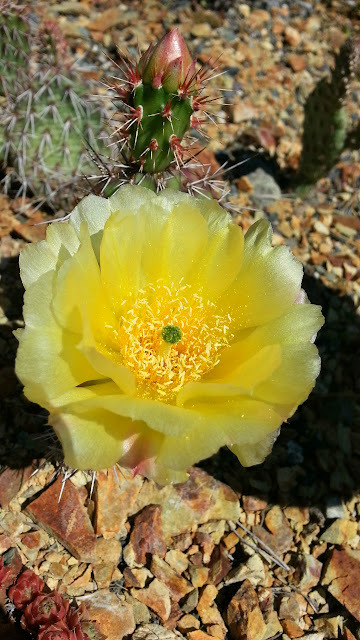 I love the acid yellow blooms of this Opuntia polyacantha from Colorado. 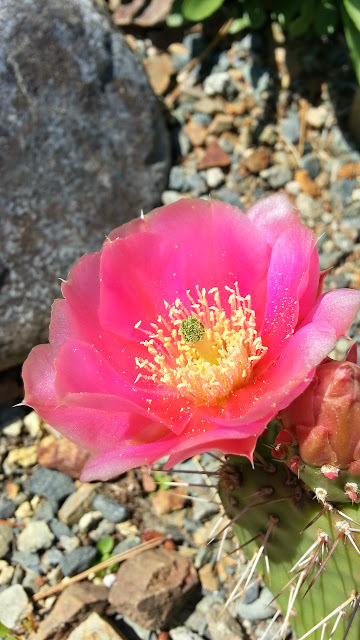 A close-up of that same Opuntia polyacantha. I got this from Beaver Creek Greenhouses, although the vast majority of my Opuntia now are hybrids I made, or collected myself in mountainous regions of North America, or traded for from other breeders & collectors. This Opuntia polyacantha from the Red Deer River Valley's badlands near Jenner, Alberta, has done well for me in certain conditions since I collected it in 2005. It does not like excessive snow and a wet shoulder season, and so does very well permanently planted in this trough which is kept dry and virtually snow-free by the roof of the adjacent potting shed. This plant sees temperatures below -30C every year, and is unaffected. There are many ball cacti in this trough too, including several collections of Escobaria vivipara and many Pediocactus simpsonii. All of these enjoy the drier conditions of the trough. More on those in Part 2. 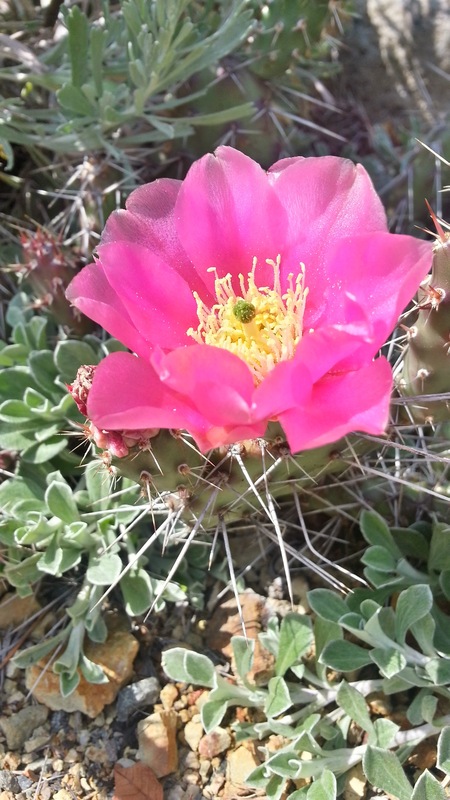 Another shot of Opuntia polyacantha from Jenner, Alberta. 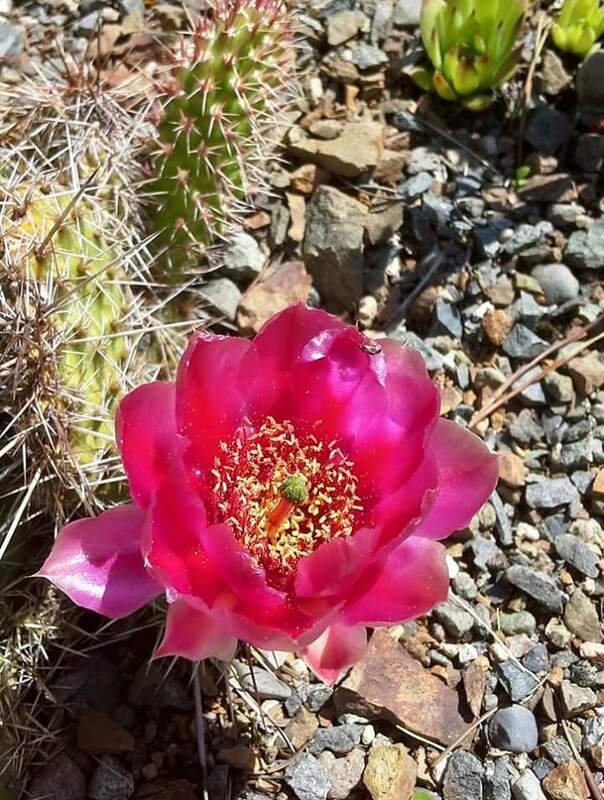 This Opuntia polyacantha is one of the original bunch I purchased in 2004 from the now-defunct Cusheon Creek Nursery on Saltspring Island, BC. The only information I have is that it's from Utah. It is one of the most winter-tolerant Opuntia I have. Another shot of that Utah Opuntia polyacantha. Good old Opuntia "Namao Rose", another Jean Wieprecht hybrid that is hands-down the best performing Opuntia for me since 2004. 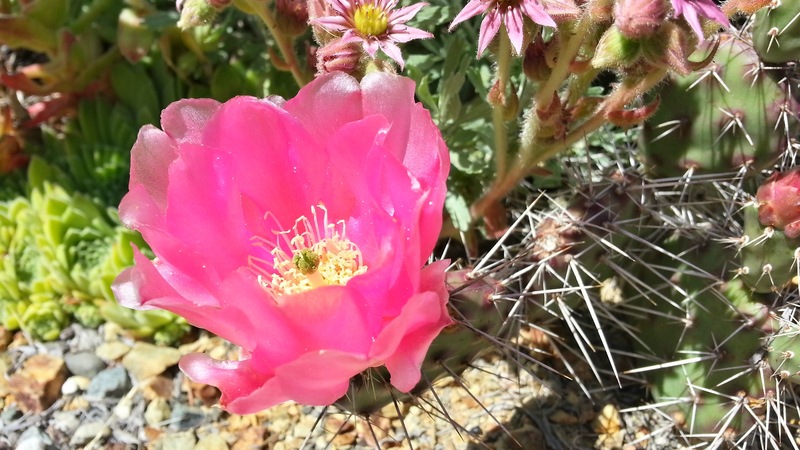 This plant handles cold, wet, and is a prolific bloomer. 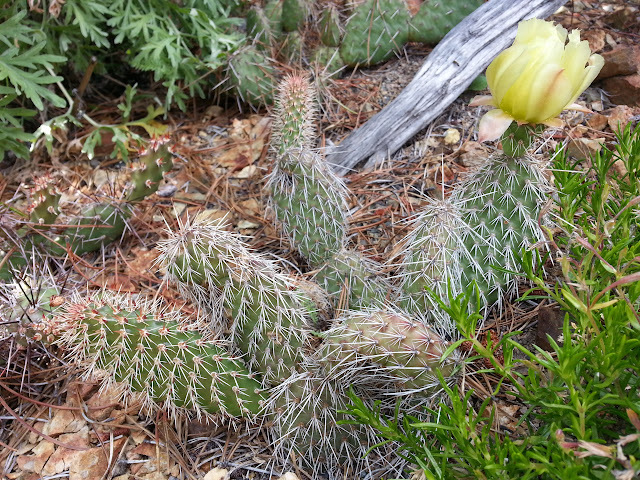 Jean said it was an open-pollinated hybrid of Opuntia basilaris, but in those days, people referred to Opuntia aurea as O. basilaris. I believe it to be the progeny of O. aurea, based on its habit and characteristics. I am quite excited about this Opuntia, which I received in trade with Francois Pare of Montreal. 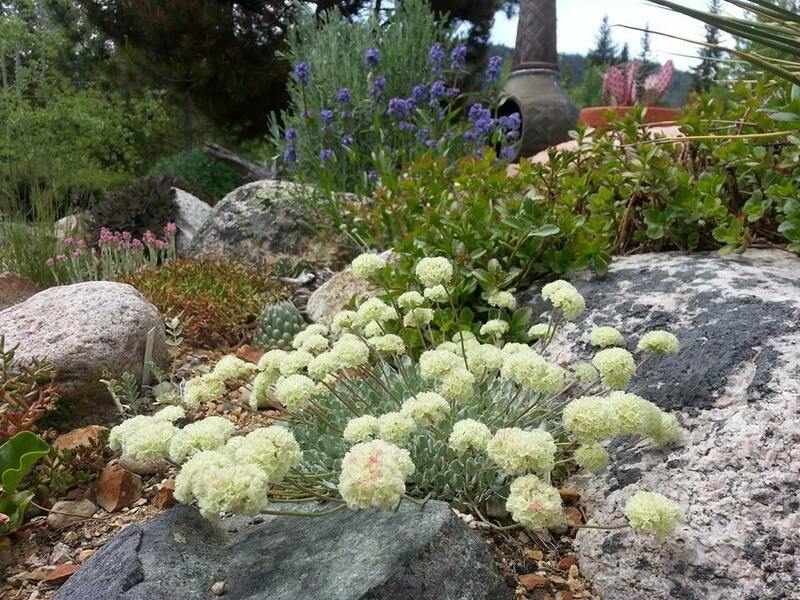 The pads are beautiful and the plant seems to do okay sitting underneath Pinus contorta. I got seed from it last year and am working on seedlings. Opuntia "Sandy Hook" and Opuntia "Namao Rose", both Wieprecht hybrids. 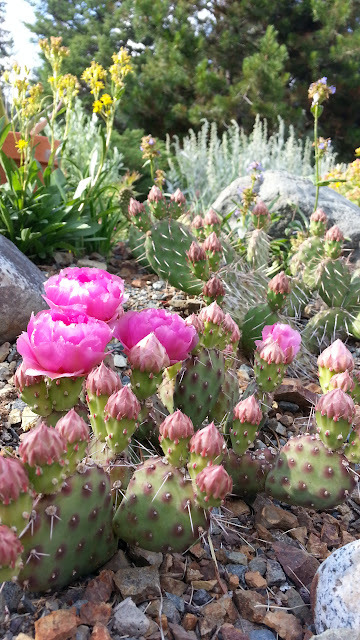 Opuntia "Linz" - a European hybrid I obtained in trade with Martin Tversted of Denmark. I love that colour - looking for a higher resolution version of this photo. Opuntia "Indian Princess" is a third Wieprecht hybrid developed in Edmonton (quite by accident - Jean's hybrids are the product of open pollination). Another amazing colour - looking for a higher resolution version of this photo.